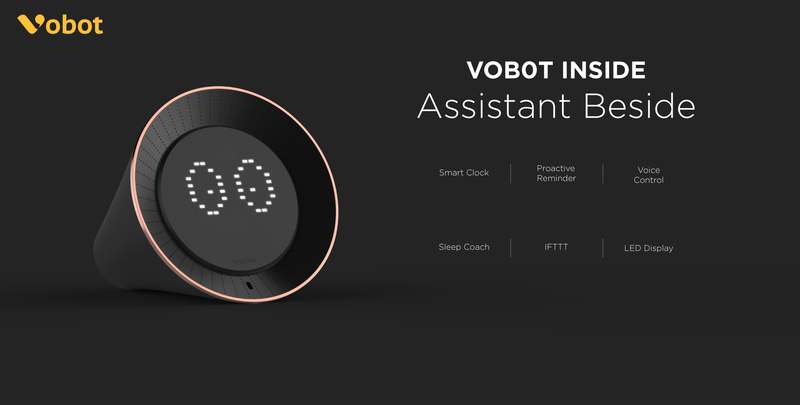 LAS VEGAS, Jan. 2, 2017 /PRNewswire/ -- Vobot Inc., a startup that specializes on AI and acoustic area, announces it will release its latest AI smart home product Vobot Clock that integrates with Amazon Alexa Voice Services (AVS) at CES 2017. Artificial intelligence (AI) and voice interaction remain hot in 2016. Among others like Google Home and Apple Siri, Amazon Echo comes as one of the most successful models, which was the the first smart home hub that hit the market. It is said that Amazon sold thousands of Echos, Taps and Dots on Christmas Day this year. Furthermore, Amazon is the first that builds an open platform - Alexa. Now AVS (Alexa Voice Service) and ASK (Alexa Skills Kit) allow third-party to build voice experiences for their devices and services. Vobot is a new product that is developed based on the Amazon ecosystem. 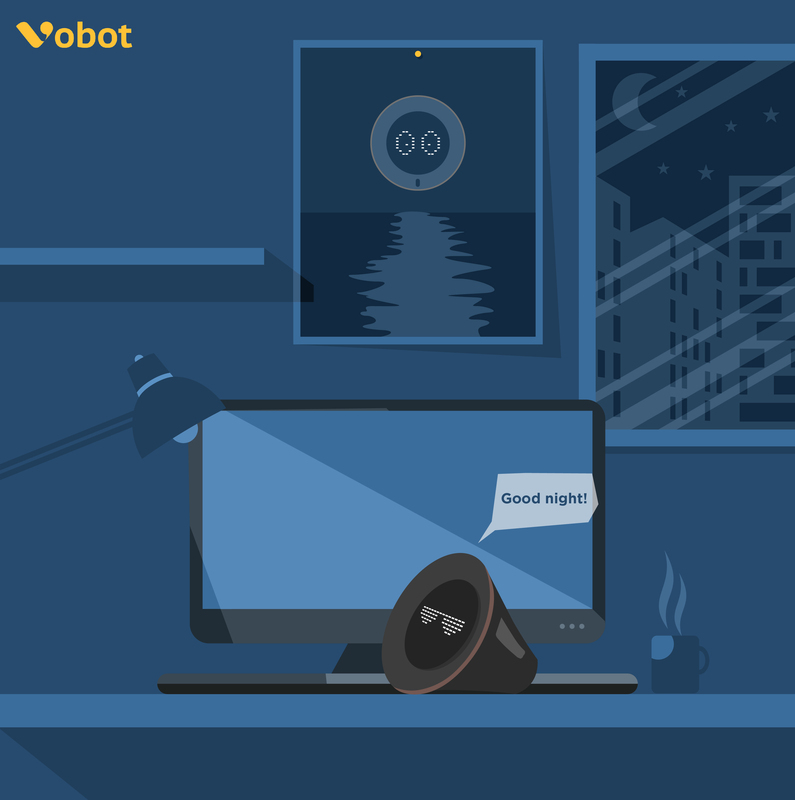 Vobot Clock is a cost-effective smart alarm with many creative features. When it comes to the sleep coach programme, pre-set wakeup and bedtime solution will help users fall asleep faster and wake up earlier. The proactive reminder function will tell or show users the right things at the right time. In addition, customizable alarm let consumers wake up from delighting music; dot matrix display makes everything clear at the first sight; internal 5W speaker makes sound clear around the room without connecting to any external amplifiers. The voice-controlled feature enables consumers to eliminate a lot of hassles that are usually caused by looking for specific App and setting it on smartphones. Its small-sized outline is convenient for users to place it in a variety of locations, such as bedroom nightstand, kitchen counter, living room, or anywhere that needs a voice-controlled companion. White noise, Hypnotic music, Natural sounds, and Personalized content are good for enhancing sleeping quality. Customized music alarm and Dynamic volume make consumers wake up in good mood. Voice-interactive and proactive reminder functionalities greatly reduces consumers' addiction to smartphones. "Vobot means voice plus robot. Our aim is to create AI as well as voice-interactive robots for people's daily lives," said Roger, CEO of Vobot Inc. "Vobot Clock tries to understand users' demands through algorithm and cloud computing." There is no button around the Clock surface, which gives the Clock a neat and streamlined appearance. Users can trigger specific intuitive function through touching (to activate voice conversation), covering (stop the alarm), or flipping (snooze) the device. Embedding Amazon Alexa to the device allows users to access their smart home appliances such as Philip Hue easily. They can also request taxi from Uber, order pizza, find nearby restaurants, get updates on Facebook, play streaming music from iHeartRadio or complete other tasks via voice control. Once received users' voice command, the Clock will respond instantly just as Amazon Echo. In the near future, Vobot plans to achieve more by the expanding functionalities of Amazon Alexa and the service of IFTTT. Therefore, Vobot Clock is defined as a personal assistant to a great degree than an ordinary piece of Clock, which can help you make the most of the day. The planned online unit price of the Clock is $35 only and will be available in early February, 2017. Besides Vobot Clock, other Vobot family products ranging from lights, speakers, buttons to related Amazon Echo accessories will also be showcased during the show. Interested parties are welcomed to visit Vobot at CES 2017, Booth #42373, Sands Expo, from Jan 5th-8th, 2017. Vobot Inc. is a startup established in California, United States. At Vobot team, we combine software algorithm and elegant hardware design to deliver the most intuitive connected experience, by making devices that will change how people interact with the future home. We leverage cutting-edge technology to solve problems, and strive to push the boundaries of innovation in AI-enabled hardware. Vobot also provides turn-key solution "Powerd by Vobot" for OEMs, enabling IoT devices with advanced Amazon AVS/ASK features in low-cost, convenient and fast-delivered way. Embedding Vobot to refrigerator, lights, speakers or other devices is accessible with our technology. To learn more about Vobot, please visit: https://getvobot.com, or email info@getvobot.com.